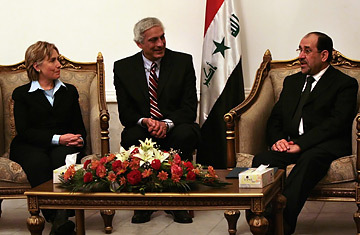 Senator Hillary Clinton meets Iraqi Prime Minister Nouri al-Maliki in Baghdad, January 13, 2006. Now that they each have registered their respective positions about tying Iraq war funding to a withdrawal timetable, congressional Democrats and President Bush are seeking a workable compromise. The most likely deal appears to be to make continued U.S. commitment in Iraq conditional on the Iraqi government meeting certain political "benchmarks." But there's no reason to believe Iraqi leaders will take a new set of benchmarks any more seriously than they have taken Washington's political exhortations until now. The benchmarks, in fact, are already well known to the Iraqi leadership, because the U.S. has spent the past year cajoling the Iraqis over them  reaching out to the Sunnis by reopening talks on the constitution, passing a new oil law guaranteeing an equitable sharing of revenues across the regions, reversing most of the purge of former Baathists from political life and government employment, and dismantling sectarian Shi'ite militias. The response of Prime Minister Nouri al-Maliki has been to verbally reassure U.S. envoys all the way up to President Bush, but then to, if not quite ignore U.S. demands, either interpret them so broadly as to make them meaningless, or else simply stall. Al-Maliki is plainly hedging his bets, acceding to U.S. demands but at the same time cushioning Shi'ite militias from Coalition attack; he has even reportedly gone so far as to purge Iraqi military officers for being too aggressive in pursuing the Mahdi Army of his key ally, Moqtada al-Sadr. Like most Iraqi leaders, Maliki is unlikely to believe that what his government does or does not do will prompt the U.S. to simply pack up and go home. The Iraqi leadership knows that the U.S. didn't invade their country out of concern for their well-being. It went to war in order to secure its own objectives  and that's exactly what the main Iraqi political factions are doing, too. (Indeed, it's hardly surprising that both the Shi'ite and Kurdish parties that dominate the current government are more inclined to pursue their own objectives than follow Washington's script, since each has bitter memories of being abandoned by the U.S. during their abortive uprisings against Saddam in 1991.) A U.S. withdrawal, after all, would mean abandoning many of its own objectives, fatally weakening the moderate Arab regimes it has vowed to protect, abandoning some of the world's largest oil reserves to be fought over by jihadists, Baathists and proxies of Iran, while Turkey and the Iraqi Kurds slug it out on the under-card of what could quickly become a regional war. Right now, the U.S. presence may be all that is holding Iraq together, but letting it fall apart would deeply damage a far wider range of Washington's interests. The Iraqi leaders appear to recognize the limits on U.S. leverage in Baghdad a lot more clearly than Democrats in Congress. Withdrawing support from Baghdad would prompt it to turn to Iran  even China might be willing to kick in a few billion if that could buy an edge in oil deals. Nor does there appear to be any plausible scenario for replacing al-Maliki. The days when a strongman regime might be able to contain Shi'ite aspirations are long gone: today's Iraqi army is predominantly Shi'ite, after all, and the Shi'ite street  answering to Sadr and Grand Ayatollah Ali Sistani  could make Iraq ungovernable by any regime that lacks their consent. Certainly the Iraqi leaders must assume that the cost in lives and treasure of the U.S. remaining in their country with no prospect of victory will become prohibitive to Washington, as it already seems to have for the majority of the American public. But postponing that moment as long as possible has its advantages, allowing the Iraqi factions to build their own strength while trying to direct U.S. firepower against their foes. Even Sadr, keeping one foot in the government of Shi'ite power and the other on the streets denouncing the Americans, is demanding a timetable. The U.S. can't win in Iraq, in the sense of turning it into a stable country supporting U.S. policies in the region. But nor is it ready to accept the consequences of declaring defeat. This may be precisely the sort of dilemma that former Secretary of State Colin Powell had in mind when he warned President Bush that "Pottery Barn Rules" applied to his invasion of Iraq: "You break it; you own it."